From the star of Discovery Channel's Naked and Marooned comes a a riveting, adventurous account of one man’s history-making journey along the entire length of the Amazon—and through the most bio-diverse habitat on Earth. Fans of Turn Right at Machu Piccu and readers of Jon Krakauer and Bill Bryson and will revel in Ed Stafford's extraordinary prose and lush descriptions. In April 2008, Ed Stafford set off to become the first man ever to walk the entire length of the Amazon. He started on the Pacific coast of Peru, crossed the Andes Mountain range to find the official source of the river. His journey lead on through parts of Colombia and right across Brazil; all while outwitting dangerous animals, machete wielding indigenous people as well as negotiating injuries, weather and his own fears and doubts. Yet, Stafford was undeterred. On his grueling 860-day, 4,000-plus mile journey, Stafford witnessed the devastation of deforestation firsthand, the pressure on tribes due to loss of habitats as well as nature in its true-raw form. 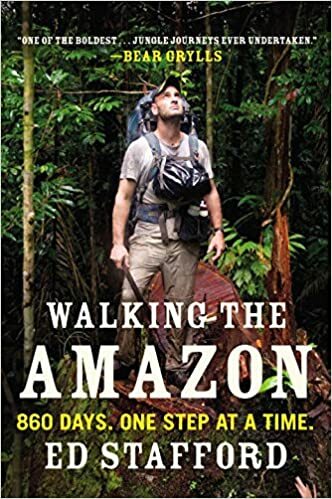 Jaw-dropping from start to finish, Walking the Amazon is the unforgettable and gripping story of an unprecedented adventure. Walking the Amazon is also available as a Spanish edition entitled Caminado El Amazonas.